Visit our VBS registration page for more details. This year at VBS we are going to explore the universe that God created for us! He created everything we see and still it was missing something. 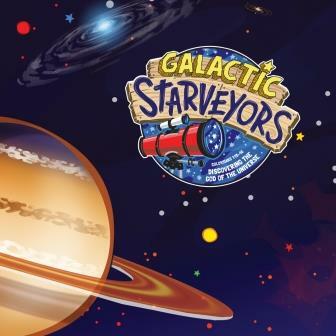 Galactic Starveyor VBS is filled with incredible Bible-learning experiences kids see, hear, touch, and even taste! Exploratory crafts, team-building games, cool songs, and tasty treats are just a few of the standout activities that help faith flow into real life. Plus, we’ll help kids discover how to see evidence of God in everyday life–something we call God Sightings. Get ready to hear that phrase a lot! Parents, grandparents, and friends are invited to join us at Closing Ceremony for each day at 11:50am! This entry was posted in News, Special Events, Uncategorized on May 26, 2017 by Sherry Cheng.